Malcolm Hoenlein, the executive vice chairman of the Conference of President of Major American Jewish Organizations (CoP), and other senior representatives from the Conference, an umbrella group that represents dozens of US Jewish NGOs, were accepted both by Erdoğan and Prime Minister Ahmet Davutoğlu. Hoenlein, who is considered to be a close associate of Israeli Prime Minister Benjamin Netanyahu, met with Erdoğan, who signaled a willingness to restore diplomatic relations with Israel, which broke down after Israel navy raided a Gaza-bound aid flotilla in 2010, aiming to break Israel's blockade on Gaza. The intervention ended in bloodshed, with Israeli commandos killing nine civilian activists in international waters. 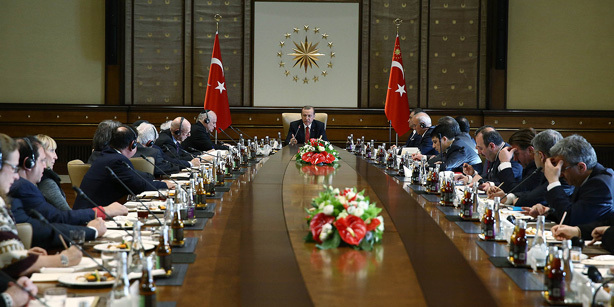 The bloody incident sparked a diplomatic crisis between Tel Aviv and Ankara. "Israel is interested in the normalization of ties with Turkey, as well as with all its neighbors, but this is a 'two-way street',” Netanyahu was quoted by Jerusalem Post as saying on Tuesday. Hoenlein flew to the Ankara meeting directly from Jerusalem. Among dozens of organizations, the Conference also encompasses leading NGOs such as the American Israel Public Affairs Committee (AIPAC), Anti-Defamation League (ADL) and American Jewish Congress. It was the first meeting between prominent Jewish figures and Erdoğan since the 2009 World Economic Forum in Davos, Switzerland, when Erdoğan stormed out of a panel session after falling out with Israeli President Shimon Peres. In December last year, President Erdoğan expressed the Turkish will to see ties with Israel restored. "Israel needs Turkey, and Turkey needs Israel. This is the reality of this region," he told reporters.